As this year comes to a close we wanted to take a moment to review some of the time we have spent together in 2013. As you look through this post, we hope you are reminded of fun and memorable moments from classes, workshops, or even posts here on this site. We look forward to the physical and mental development, personal growth, and enjoyable memories that we will all enjoy as we train together in the new year. Happy New Year to you all! We were honored to host two Qigong workshops in Pine Grove, including a workshop on the "8 Pieces of Brocade Qigong Set." This was also the month in which we posted a video of the 2nd part of the Yang Style Tai Chi Traditional Long Form as an aid to students practicing at home. Other than a Qigong workshop on a section of the "Five Animal Exercises Qigong Set," this was a fairly uneventful month, full of the consistent, dedicated training that produces the health benefits and skills that people seek in Tai Chi and Qigong training. Bravo to the students who understand the rewards that only come from perseverance in training! More weekend Qigong workshops were held this month along with the regularly scheduled classes, but two events that set this month apart were the publishing of Shifu Plitt's first Qigong Workshop Manual and a post with information and helpful tips for students who wish to train in China. One of the most exciting month of the year, April is the month in which World Tai Chi and Qigong Day takes place. We had a blast celebrating this day with our community! Another great month of steady training and overall improvement. A big thank you to all of the dedicated students that never give up! This month was an exciting month for many of our students! Two students earned their 3rd Level Orange Sashes and two students earned Their 1st Level White Sashes! A very proud moment for all involved. In July we posted the names of the postures in the Yang Tai Chi 24 Form and uploaded a video of Shifu Plitt going through the Qigong exercises we use as a cool down in class, which can be used as simple exercises at home for overall health. This month was mostly a regular training month, but we did post videos Shifu Plitt performing the Yang Tai Chi 24 Form and the 3rd part of the Yang Tai Chi Long Form to aid students practicing at home. A month of diligent practice and Mind-body improvement. A wonderful month of practice with some time off for the holidays. Along with the enjoyment of family, friends, and training, we posted a 6 video series of basic exercises to help beginning Tai Chi students develop a good root and sense of balance, as well as posting a video about Tai Chi vs. Arthritis. Now we bring this year to a close with much gratitude to all of the wonderful people that train with us, shop at Amador County's Online Health Food Store, and seek self and community improvement through the practices of Tai Chi and Qigong. Thank you for all that you do, thank you for all of your support, and we wish you the very best New Year! I have good news for my students. I have just finished uploading a video series to Youtube, that covers the basic balance and rooting exercises that are among the first things students learn in class. If you need to work on your balance, the exercises in these videos will be invaluable to you. I hope this will be a helpful resource while you are practicing at home. Enjoy! This picture says "kung fu" which is commonly thought of as a fighting style, but in Chinese it actually refers to any skill that take hard work over a long period of time to master. So you can think of Tai Chi as your kung fu. Patience and mastery are always more important than learning the next move. Here is an interesting video of a new study that is being conducted on the effectiveness of Tai Chi on arthritis pain. Have a look. This announcement is to let everyone know which training days will be skipped during the holidays. If any classes will be skipped at New York Fitness in December 2013 we will post that information asap. We wish you all a wonderful, safe holiday season! We just wanted to take a moment to thank everyone who attended our 1st "Open Tai Chi Night." It was great having all there and we hope you had as much fun as we did! We hope to have another one before the end of the year, but we don't have a date set yet. Stay tuned and we will let you know when as soon as we can. "Open Tai Chi Night" starts at 6:00p.m. We had a friend and customer post this picture on her Facebook account the other day and we thought it was too cool to keep to ourselves. So we asked for permission to pass it on to you and it was enthusiastically granted. This picture was posted under the caption, "All I need for Tough Mudder tomorrow! 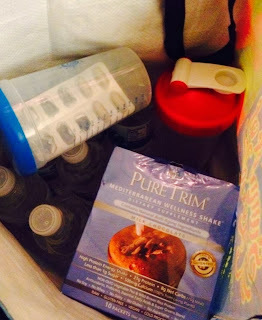 < 3 Puretrim shakes!" With a caption like that, you know the shakes must be working. 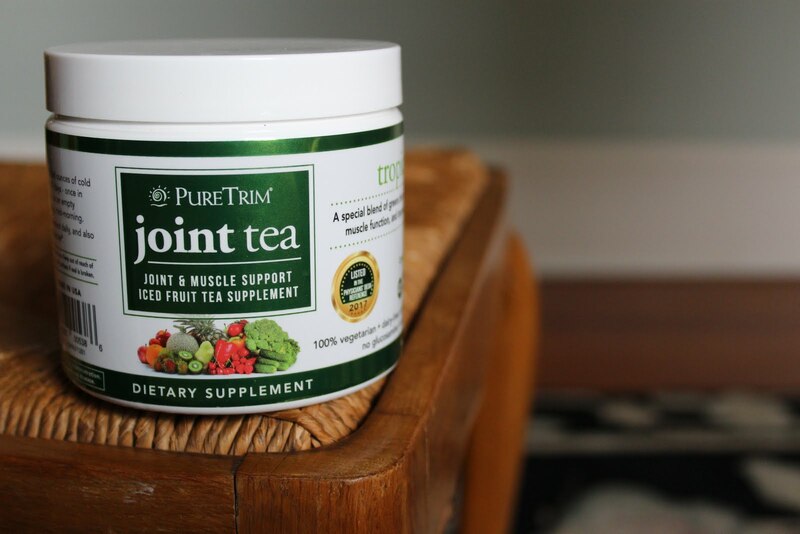 :) Pure Trim Shakes are available at Amador County's Online Health Food Store. Effective AUGUST 19, 2013 classes at the KSW Karate Dojo will be changing. The new class schedule will begin on August 19 and will continue indefinitely. For those students who are working on the 24 form, here is a video for you. We hope you will find it useful when you are practicing on your own time. Enjoy! We finally filmed the third part of the Yang Style Tai Chi Long Form and posted it on Youtube. To those students who are learning this section, we hope you all find this useful. Enjoy! Here is a short video (approx. 10 min.) of self-massage Qigong exercises that we use as a cool down after every Tai Chi Class. These exercises are an excellent way to help you wake up in the morning and to make you feel energized as you start your day. They are also excellent cool down exercises after any workout (running, martial arts, weight lifting, etc) to relax the body and increase circulation to the muscles and joints. These types of self-massage techniques can help your body repair faster after workouts, which means less down time and a healthier body. Most of these exercises are very silly looking, but once you feel the difference they make, you probably will not care about their silly appearance. Enjoy! 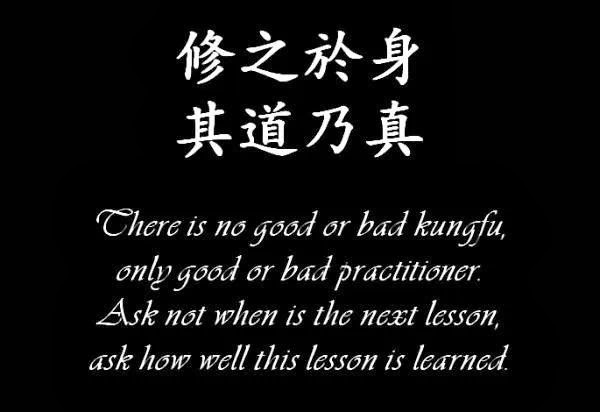 There will not be a Qigong class at Sophia's Well of Wisdom in Sutter Creek this upcoming Sunday (July 28, 2013) because Shifu Plitt will be out of town. Qigong will resume on August 4, 2013 and continue every Sunday evening, as usual, after that. Have a great weekend, all. Names of Postures in the Yang Tai Chi 24 Form. I have been asked by several students to post the names of the movements for the Yang Tai Chi 24 Form so I am listing them here for those of you who have been wanting this list. I have also posted this list, as well as the list of movements in the Yang Style Traditional Long Form on the "Chinese Terminology for Tai Chi, Qi Gong, and Chinese Martial Arts" page of this site. I hope you all find this helpful. We have moved the July 27, 2013 "Bear Qigong" workshop to Saturday, August 3, 2013. When we initially set the date for this workshop we overlooked the fact that the Amador County Fair is happening on the weekend of the 27th. We do not want to try to pull anyone away from the fair so we decided to move the date forward one week. If you know anyone who is planning to go please pass this on. Thanks! :) We are looking forward to seeing you all at the workshop and we hope you have a chance to enjoy the fair this year. The Bear Qigong Set from the "Five Animal Exercises Qigong" is meant to be practiced during the late summer. The internal organ that it is focused on strengthening and healing is the spleen, but because of the way these exercises effect the body, the kidneys, liver, gallbladder, stomach, and pancreas also benefit. This is one of the easier Animal Qigong sets and a very useful one for maintaining health. This is the only workshop we will be offering during the summer of 2013. Please be sure to bring a plenty of water. After practicing this Qigong set it is important to rest and drink plenty of water. There will be an hour or so after the workshop where the participants are welcome to rest for a while before leaving. I hope you're all ready for a really relaxing and refreshing experience! · Each person will receive a booklet with details about the exercises and photos of the movements to help everyone remember the exercises they learned. 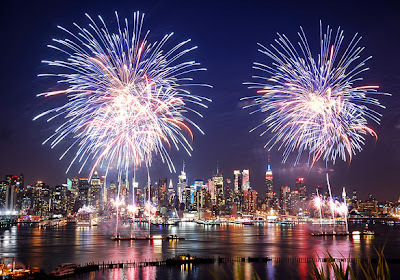 This is just a reminder that there will be no morning Tai Chi class at New York Fitness on Thursday, July 4th 2013. This class will proceed as usual starting Tuesday, July 9, 2013. We will miss seeing you all in class and we hope you all have a safe, fun-filled 4th! According to an article published in "Supreme Chi Living," an online journal by The American Tai Chi and Qigong Association, Tai Chi practitioners report better quality of life than those active in other activities popular in our culture today. We have included the article as well as a link back to the original website below for you to see it for yourself. Enjoy! June 27, 2013 - Tai Chi Chuan (TCC) is a traditional Chinese medicine practice and martial art with bio-psychosocial aspects. A study published by Journal of Complementary and Alternative Medicine in its May 2013 issue aimed to examine the impact of participation in TCC on multiple domains of Quality of Life (QoL) and to assess the involvement of the psychological factors of self-efficacy, Locus of Control (LoC) and Hope in these effects. A total of 68 participants from the general community (13 males and 55 females) aged between 18 and 68 (M=43.55 years) and not currently suffering from a mental or physical illness took part in the study. It was found that TCC participants, as a group, scored significantly better than those in sedentary (book club) and active (gym exercise) control conditions on Psychological and Physical QoL, and that the Physical QoL benefits of TCC continue to accrue with years of practice. The three psychological factors were shown to variously mediate (self-efficacy) and moderate (internal LoC and Hope) this latter relationship. Whilst the results bear limitations (in particular small sample sizes), it is hoped that these findings will encourage further research into TCC, and consideration of TCC as part of the range of treatment options available in community-based mental and physical health management." View Article on Original Website Here. If you live in Amador County and are looking for a place to study Tai Chi Chuan, take a look at our Class Schedules and Locations page to find the best time and location for you. 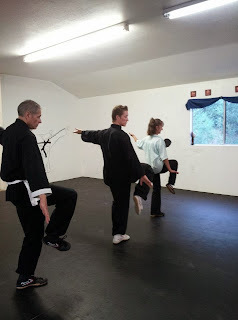 We offer Tai Chi Chuan classes in Jackson, CA and Pine Grove, CA as well as a Qigong class in Sutter Creek, CA. Free Shipping from "Amador County's Online Health Food Store"
We know times are tough for a lot of people and we are always trying to help those in our community save money on the products and services we offer. For that reason, we are proud to present this offer. There is a Free Shipping program available on "Amador County's Online Health Food Store" that is designed to help simplify your ordering process and save you money, at the same time. If you sign up for automatic shipments with at least 3 products, the shipping is free. The really cool part is that you can have your products shipped to you once a month, once every two months, or once every three months. For example, if you use one bottle of Daily Complete each month, you can set your auto-ship to send three bottles, once every three months. That way you don't have to pay for the shipping and you still get one bottle of Daily Complete for each month. I hope you all find this program useful and I hope it makes your lives a little simpler. If you have any questions please Contact Me. Over the past few weeks we have had several students at the KSW Karate Dojo in Pine Grove, test for their next Sash Level in Tai Chi Chuan. Due to their hard work and the time they have put into their training, they have passed each test with flying colors. Here we would like to congratulate them on their accomplishment and show you all pictures of these students' promotions. We hope you will join us in congratulating them. Pete (Shifu Plitt's Dad) removing his old sash. Pete receiving his new Level 3 Orange Sash. Pete tying on his new sash. Pete showing off his new rank certificate with Shifu Plitt. Kathy handing in her old sash. Kathy being presented with her Level 3 Orange Sash. Kathy being presented with her Level 3 Orange Sash certificate. Kathy showing off her new rank certificate with Shifu Plitt. Samantha receiving her new Level 1 White Sash. Samantha receiving her White Sash rank certificate. Samantha Showing off her new rank certificate with Shifu Plitt. Elizabeth receiving her new Level 1 White Sash. Elizabeth receiving her White Sash certificate. Congratulations to all of these students for their hard work, perseverance, and achievements! We're proud to have them training with us! 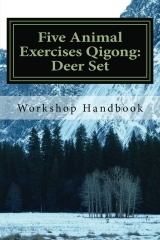 The "Five Animal Exercises Qigong Set" is one of the oldest known Qigong forms in China. Each of the five animals has an internal organ pair associated with it and a season in which it is best to practice. This set is used all around the world for health improvement and maintenance. The Tiger set in meant to be practiced during the spring months and was designed to balance the liver and the spleen. Two organs that are very important in maintaining good health. The movements of the Tiger set are also excellent for stretching and strengthening the back, hips and legs. To ensure that all those who attend get the most out of this workshop, each participant will receive a booklet with detailed instructions and pictures of each movement to help remind them of each movement and the correct way to do it after the workshop is over. On June 5, 2013 two of my students, Pete and Kathy, tested for their Level 3 Orange Sashes in Tai Chi. Their test included sticky hands training, the second part of the Yang style long form, coiling training, and much more. I'm very proud of them for all the hard work they have put into their training and I would like to congratulate them on achieving their new rank of Orange Sash - Level 3! Good job, you two! Keep up the good work! Below is a short video with clips of footage taken during the test. Enjoy! Here is a short video collage of the World Tai Chi and Qigong Day Celebration we had on April 27, 2013 in Pine Grove, CA. We had Tai Chi and Qigong workshops, free chair massages, free ice cream, and tasty smoothies for everyone who attended. We hope you enjoy this peek into our celebration and we hope you will all join us again next year for more workshops and fun, at our 2014 World Tai Chi and Qigong Day celebration. A big thank you to everyone who attended and to all those who helped make it happen! 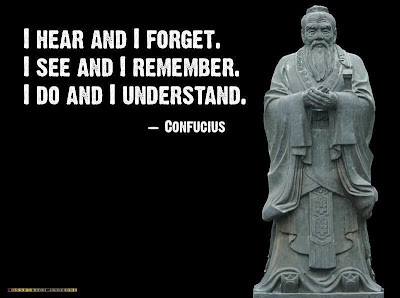 When learning Tai Chi and Qigong do not get caught up in the desire to learn the next move or the next technique. Spend time doing what you already know over and over again. When you practice this way you will begin to develop a true understanding of what you are practicing; Only then you will be ready to learn something new. A Fun World Tai Chi and Qigong Day 2013 Celebration! Yesterday was "World Tai Chi and Qigong Day" (WTCQD), a day where people all over the world gather at 10:00am in there time zones to practice Tai Chi, share ideas and skills, and teach others about these amazing arts. In Pine Grove, CA at the KSW Karate Dojo we celebrated WTCQD with our Amador County community and enjoyed the incredible talent and knowledge of Sensei Rodney Peoples, the head Sensei and KSW Karate, as he led us through a ten-step breathing and energy cultivation exercise; the sweet spirited, relaxing and flowing Tai Chi movements taught by the wonderful Marilyn Nutter, Tai Chi instructor in Sutter Creek; awesome chair massages from the talented Andrea Newman, the massage therapist at KSW Karate; and the fun and informative Tai Chi and Qigong workshops led by Shifu Andrew Plitt. There was also free ice cream available to those who attended workshops, and we had smoothies for lunch made from the Pure Trim Wellness Shakes to keep everyone energized and ready for more celebration. Unfortunately we did not take very many pictures of this event, but we will post the pictures we did take; mostly between workshops. The good news is, we took a lot of video of the workshops and we will be posting video segments in the very near future. Thank you to everyone who helped make this event happen and to everyone who attended! You all made this "World Tai Chi and Qigong Day" an incredibly fun, enjoyable and memorable event! Some of the wonderful people who attended, sipping on Pure Trim Wellness Shakes, grabbing a bite to eat and enjoying each others company between workshops. More of the lovely people who attended enjoying a chat between workshops. In this picture Marilyn Nutter is beginning her wonderful Chi Movement workshop by explaining what we will be doing and the benefits that come from the exercises she will be showing us. We hope you all enjoyed this event as much as we did and, if you were not able to attend this year, we hope you will join our celebration next year on April 26, 2014. Check back soon for video clips and check out our Workshops and Seminars page for upcoming events. 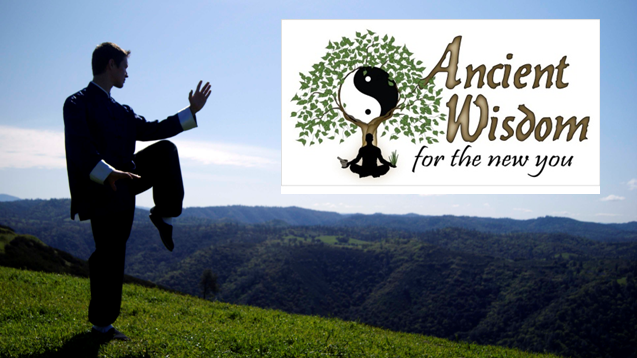 This is just a reminder that the Amador County celebration of World Tai Chi and Qigong Day is only a week away. Our current activity schedule is listed below. There will be free ice cream available (while supplies last) to those who participate in any of our scheduled activities. This is a free event open to everyone and we hope you will all come join us for this wonderful celebration. Free chair massages will also be available to everyone who attends. When it comes to health, most people know that exercise and proper nutrition are very important, but fewer people understand the importance of detoxifying the body. If you click on the following link you will be able to view a video by Dr. Joel Robbins M.D., N.D., in which he discusses the importance of proper detoxification in a healthy lifestyle. He also discusses the ancient Mediterranean herbal blend that we carry on Amador County's Online Health Food Store. He offers very good information for anyone interested in living in a healthy manner. Enjoy! Today was our "Ultimate Fast Food Smoothie Party" where we talked about highly nutritious smoothies that can be made on the go for people with busy schedules that want a healthful alternative to main stream fast food. We want to say thank you to everyone who came and everyone who helped set it up! Next weekend we will be having two more events. 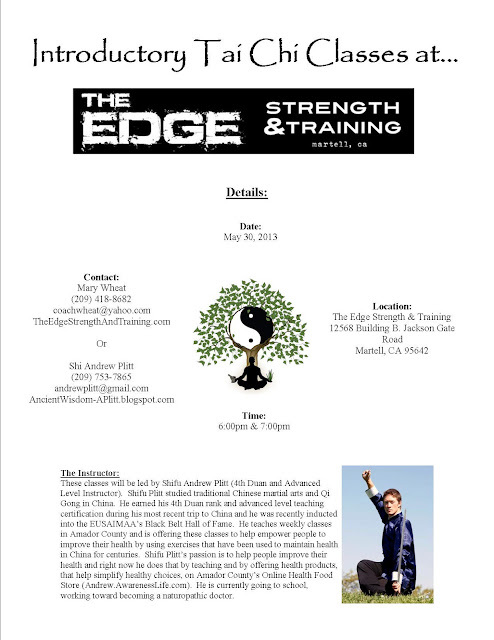 The first is the "Upper and Lower Back Health Qigong Workshop" in which we will be going over ancient Chinese exercises that can help keep your back strong, healthy and flexible. The second is a "Detox Party" in which we will be discussing an ancient Mediterranean herbal detoxification blend that can help with your internal spring cleaning this year. Below are links to the facebook event pages where you can get more detailed information about these events. Everyone is welcome to attend! "Upper and Lower Back Health Qigong Workshop"
Chen Style Tai Chi Form Video. Here is a video we came across on youtube and thoroughly enjoyed it. We had to share it with you because it is incredible. Enjoy! This is just a reminder that there are 3 workshops happening this weekend in Pine Grove, CA. We know this is typically a busy weekend for people, but if you have some free time to spend on yourself before Sunday we think you will enjoy these workshops. It might be fun for you to finish the month of March with a life changing experience. Many people are all too familiar with back problems, either because they know someone who has experienced them, or they have personal experience. In this workshop Shifu Plitt will be teaching ancient Chinese Qigong exercises that help promote a strong, healthy, flexible back. This will be a shorter workshop because we do not want to fatigue anyone's back. Because this is a shorter workshop there will not be a booklet handout at the beginning. All attendees are encouraged to bring notebooks and cameras to help remember each exercise after the workshop is over. The 8 Pieces of Brocade Qigong set (Ba Duan Jin) is one of the oldest known forms of Qigong practiced in China today. It is believed to have been developed by General Yue Fei as a means of keeping his soldiers healthy and battle ready. 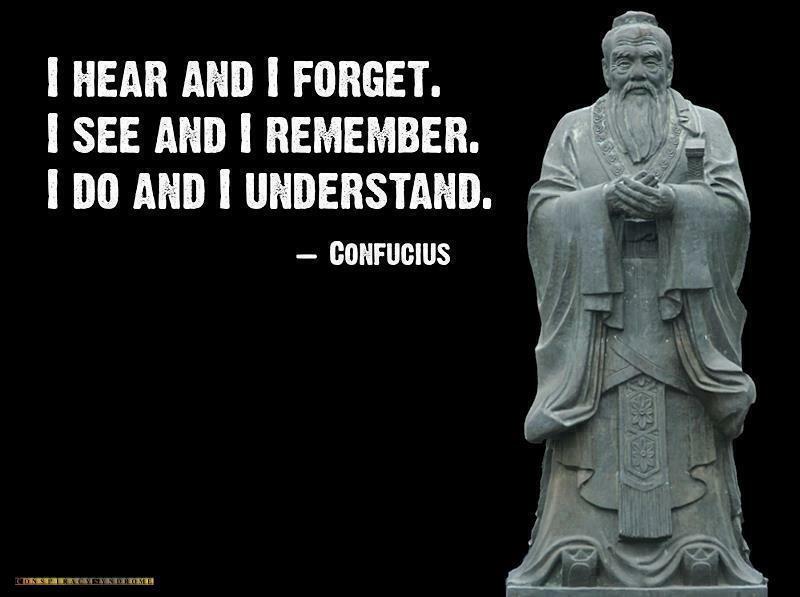 General Yur Fei is believed to have studied Chinese medicine and the "Five Animal Exercises Qigong" set and therefore based the "8 Pieces of Brocade" on this knowledge. Because of it's many health benefits it has become one of the most famous Qigong sets around the world and is practiced by millions of people. Please be sure to bring a thermos with hot water and really warm clothes for afterwards (maybe even a blanket). After practicing this Qigong set it's important to rest and drink plenty of warm water. There will be an hour or so after the workshop where the participants are welcome to rest for a while before leaving. Qigong has different effects on different people. Some people feel very invigorated afterwards and others want to take a nap. This set especially can make you really tired when you are first learning it because the different exercises tend to knock loose toxins that are stored in the kidneys and other body tissues. I would rather have you all rest at the dojo for a bit than to try to drive home when you're really tired. I hope you're all ready for a really relaxing and refreshing experience! This workshop is very different from any other workshop we have put on so far. Rather than focusing on exercises to promote health we will be encouraging people to employ themselves rather than waiting for a call from the unemployment office. This workshop comes from a desire to empower those in our community to become the leaders in this economy rather than the victims. We will also be discussing wiser ways to spend money and time. This workshop will be split into two parts. The first will offer tips for people who have thought about starting their own business, but don't know where to start, better ways to manage time and better ways to manage, and think about, money. The second part will be specifically about what Shifu Plitt does, how he got started and how his business works. · Each person will receive a booklet with the main points of the workshop to help guide them through their entrepreneurial adventure. Some people dream of studying Traditional Chinese Martial Arts (TCMA), including Tai Chi and Qigong, in China, but don't know where to start. When I was planning to go to China to study TCMA I didn't have anyone I could turn to for advice about where to go or what to expect. I literally just found a website for a martial arts school, saved up money by working while in high school and jumped on a plane three months after turning eighteen. It was a very exciting adventure, but unfortunately the school I went to, in spite of having good martial arts training, was not a very good school in other respects. Even though I learned a great deal, and I still think fondly of my time training there, I wish I would have known that there were other schools that I could have attended. 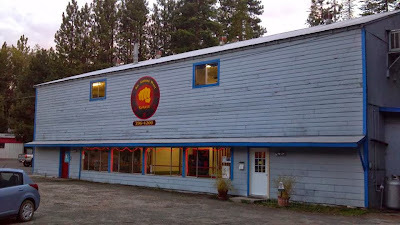 Below are some pictures of the Kunyu Shan Shaolin Martial Arts Academy. More information is available at www.chinashaolins.com. If you have any questions about attending this academy I would be happy to help in any way that I can. You can also contact the academy directly by clicking here. I hope you have enjoyed these pictures, and if you are someone who is looking to train in China, I hope this has made things a whole lot easier on you.